PUNE: At just 8, Trupti (name changed) is an expert juggler of time between her iPad, cellphone and laptop. While a movie buffers on the laptop, she is playing two simultaneous games on the other mobile devices. Trupti is the only child of a busy working couple. After school, she spends some time at a creche before her mother picks her up. Gadgets keep her entertained. “Since we are both working, the gadgets keep her occupied,” said Trupti’s mother. But internet/gadget addiction has become a very real threat today. And instances of children going to extreme lengths to feed their addiction are on the rise. Recently, a 13-year-old boy committed suicide after his mother chided him for playing mobile games and ignoring his studies. Experts said the first step towards curbing the addiction must be initiated by parents. 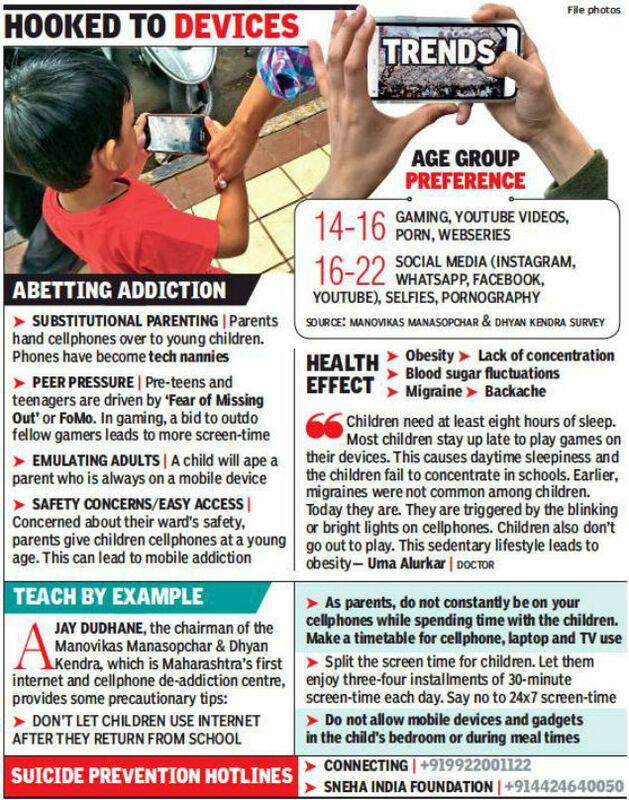 “The trend is more noticeable among the children of new-age parents who substitute quality time with a cellphone,” said Mukta Puntambekar, Muktangan rehabilitation centre director. The gadget obsession starts early. Even children as young as two years old can be addicted and it is partly because of faulty parenting, Puntambekar said. “The child is hypnotized by the screen and isn’t even aware of what he or she is eating. Later in life, the child may face different kinds of health issues,” she added. Children also take cues from their own parents. Seema Darode, a clinical and school psychologist with 25 years of experience, cited the example of a 35 year-old mother from Mumbai. “She has a 12-year-old daughter. She said the child always sees her talking on the cellphone and has started emulating her,” Darode said. The psychologist added that addiction also depends on the child’s age. “Usually, cellphone addiction is more common among teens. We try to explain to them why and how this addiction is harmful. We present the pros and cons, the scientific way and the psychological way and how it affects a person academically,” she said. She admitted that faulty parenting was one of the main reasons in the spurt in cellphone addiction. “We see nuclear families with one or two children. Parents are working and the child is left alone in the house or with the grandparents. The child has no option but to turn to the internet and gadgets. They feel comforted by social media or gaming,” she said. Nandini Charles, the principal of Vikhe Patil Memorial School, said parents often indulge their children by giving them gadgets. “Many parents succumb to the peer pressure their children face. It begins as wanting to connect for safety reasons, but ends up with the child being on the phone all the time. We tell parents that once the child returns home, s/he doesn’t need to be on the cellphone after 8pm. Even if s/he wants to be on social media, 8pm is a good time to call it a night,” she said. At Muktangan, Puntambekar too starts off by counselling parents. “Most times, after the parents are counselled in two or three sessions, there is no need to call in the child. Parents often don’t know how to handle this problem. Too much screen-time affects concentration, creativity and confidence. It also affects studies and social skills,” she said.